We had excellent weather with lots of interested visitors. The Mayor and one councillor stopped by to check us out. Looking forward to a bigger show next year. This is an informal information event for the public and EV enthusiasts to get together and spread the word about electric vehicles. This is not a sales event organised by car dealers! Participants please arrive by 10:30 so we can get organised before taking off on short drive. 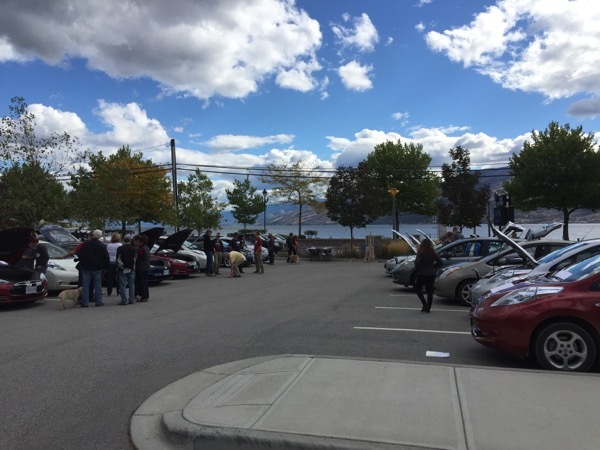 10:30 - 11:40 meet and line up for 4km drive around Peachland. 11:45 - 12:00 Drive route North from the community Centre to 13th ave, up to highway 97, South on 97 to just pass the Princeton/Beach stop light and regroup at the boat launch parking lot, North on Beach returning to the Community Centre for a casual gathering/car show. 12:00 - 1:00 Gathering/Car showing at the Peachland Community Centre. There is also a Peachland Farmers and Crafters market going on from 10-2 in Peachland, this is an easy walk from the Community Center parking lot where your car will be parked for the show. A DC charger is active in West Kelowna only about 10km away. For the Tesla owners there is a Supercharger in Kelowna and a lot of wineries in the area have destination chargers. This will be updated as more features are added. Registered attendees report 341,586 electric miles driven.